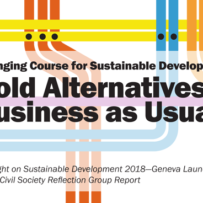 On 18 September, UNRISD and Friedrich-Ebert-Stiftung Geneva will host the launch of the Civil Society Reflection Group on the 2030 Agenda for Sustainable Development‘s 2018 report. The report, Exploring New Policy Pathways: How to overcome obstacles and contradictions in the implementation of the 2030 Agenda, assesses progress towards the sustainable development agenda. The report’s overarching assessment is that “The world is off-track in terms of achieving sustainable development and fundamental policy changes are necessary to unleash the transformative potential of the SDGs”. When it comes to social protection in particular, the Group argues that “a huge gap… exists between the commitment to implement social protection systems and the current reality”. The Civil Society Reflection Group was created in 2011 to offer independent analysis of international development policy. Since 2016, the Group has offered an annual assessment of the implementation of the SDGs, including social protection. Download the 2016 and 2017 reports and visit the official event page to learn more and register.